"I" -shaped studs fabricated from min 25 MSG galv steel, min 2-1/2 in. deep, 1-1/2 in. wide. Studs contain 3/4 in. wide by 2-1/4 in. high holding tabs spaced 2-3/4 in. OC. Cut to lengths 3/4 in. less than floor-to-ceiling height and spaced 24 in. "C-T" or "C-H" -shaped studs, min 2-1/2 in. deep, 1-1/2 in. wide, fabricated from min 25 MSG galv steel. Cut to lengths 3/4 in. less than floor-to-ceiling height and spaced 24 in. 2A. Furring Channels — (Optional, Not Shown) — For use with Systems A and C (double layer systems). Resilient furring channels fabricated from min 25MSG corrosion protected steel, installed horizontally, and spaced vertically a max 24 in. OC. Flange portion of channel attached to each intersecting "I", "C-T", or "C-H" stud on side of stud opposite the 1 in. liner panels with 1/2 in. long Type S or S-12 pan-head steel screws. When furring channels are used, wallboard to be installed vertically only. 2B. Steel Framing Members* — (Optional, Not Shown) — For use with Systems A and C (double layer systems). Furring channels and Steel Framing Members as described below. a. Furring Channels — Formed of No. 25 MSG galv steel. 2-9/16 in. or 2-23/32 in. wide by 7/8 in. deep, spaced max. 24 in. OC perpendicular to studs. Channels secured to studs as described in Item b. 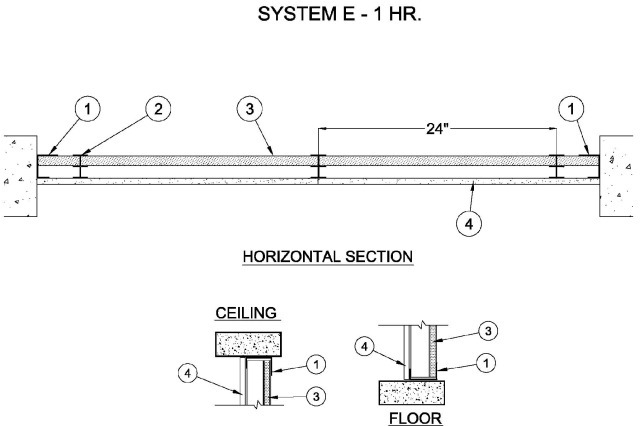 Gypsum board (Item 4) installed vertically only and attached to furring channels as described in Item 4.
b. 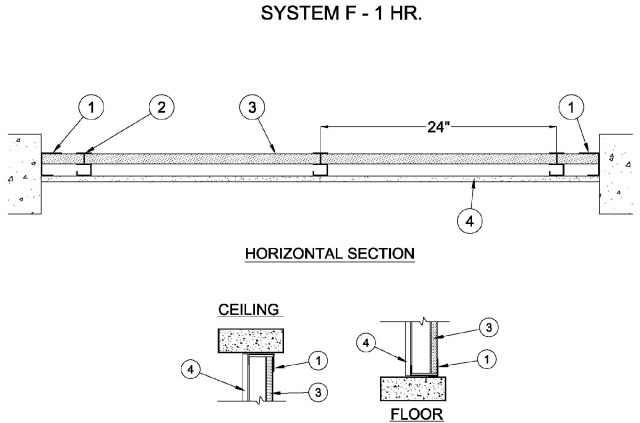 Steel Framing Members* — Used to attach furring channels (Item 2Ba) to studs (Item 2). Clips spaced max. 24 in. OC., and secured to studs with No. 8 x 1-1/2 in. minimum self-drilling, S-12 steel screw through the center grommet. Furring channels are friction fitted into clips. RSIC-1 clip for use with 2-9/16 in. wide furring channels. RSIC-1 (2.75) clip for use with 2-23/32 in. wide furring channels. 2D. Steel Framing Members* — (Optional, Not Shown) — For use with Systems A and C (double layer systems). Furring channels and Steel Framing Members as described below. b. Steel Framing Members* — Used to attach furring channels (Item 2Da) to studs (Item 2 ). Clips spaced max. 24 in. OC. GENIECLIPS secured to studs with No. 8 x 1-1/2 in. minimum self-drilling, S-12 steel screw through the center grommet. Furring channels are friction fitted into clips. b. Steel Framing Members* — Used to attach furring channels (Item 2Ea) to studs. Clips spaced 24 in. OC, and secured to studs with No. 8 x 2-1/2 in. coarse drywall screw through the center hole. Furring channels are friction fitted into clips. a. Resilient Channels — Formed of No. 25 MSG galv steel, spaced 24 in. OC, and perpendicular to studs. Channels secured to studs as described in Item b. Ends of adjoining channels overlapped 6 in. and secured in place with two No. 8 15 x 1/2 in. Philips Modified Truss screws spaced 2-1/2 in. from the center of the overlap. 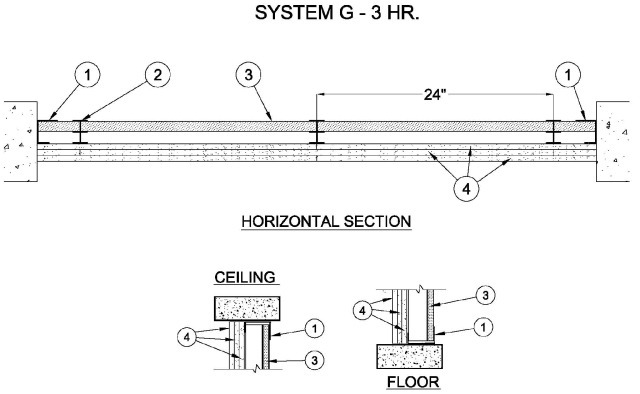 Gypsum board installed vertically only and attached to resilient channels as described in Item 4.
b. Steel Framing Members* — Used to attach resilient channels (Item 2Fa) to studs. Clips spaced 48 in. OC., and secured to studs with No. 8 x 2-1/2 in. coarse drywall screw through the center hole. Resilient channels are secured to clips with one No. 10 x 1/2 in. pan-head self-drilling screw. 3. Gypsum Board* — Gypsum liner panels, nom 1 in. thick, 24 in. wide. Panels cut max 1 in. less in length than floor to ceiling height. Vertical edges inserted in "T" -shaped section of "C-T" studs or holding tabs of "I" studs. Shaftliner held in place by the tabs of the steel studs, spaced 24 in. OC. Gypsum panels, nom 1/2 or 5/8 in. thick, 48 in. wide, applied in one of the following methods. Method 1 — Base layer installed horizontally to steel studs with 1 in. long Type S self-drilling, self-tapping bugle head steel screws spaced 24 in. OC. Face layer installed vertically to steel studs with 1-5/8 in. long Type S self-drilling, self-tapping bugle head steel screws spaced 12 in. OC. Method 2 — Base layer installed vertically to steel studs with 1 in. long Type S self-drilling, self-tapping bugle head steel screws spaced 24 in. OC. Face layer installed horizontally to steel studs with 1-5/8 in. long Type S self-drilling, self-tapping bugle head steel screws spaced 12 in. OC. Gypsum panels, nom 1/2 or 5/8 in. thick, 48 in. wide, applied vertically or horizontally to steel studs with 1 in. long Type S self-drilling, self-tapping bugle head steel screws spaced 12 in. OC. Gypsum panels, 5/8 in. thick, 48 in. wide, applied in the following method for a 1 Hour Rating — One layer installed vertically to steel studs with 1 in. long Type S self-drilling, self-tapping bugle head steel screws spaced 12 in. OC. Gypsum panels, 5/8 in. thick, 48 in. wide, applied horizontally or vertically for a 3 Hour Rating — Base layer attached to the steel studs with 1 in. long Type S self-drilling, self-tapping bugle head steel screws spaced 24 in. OC. ; 2nd layer installed with 1-5/8 in long Type S self-drilling, self-tapping bugle head steel screws spaced 24 in. OC and staggered 12 in. from base layer; Face layer installed to steel studs with 2-1/4 in. long Type S self-drilling, self-tapping bugle head steel screws spaced 24 in. OC in the perimeter and 16 in. OC. in the field and staggered 12 in. from 2nd layer and 24 in. from base layer. 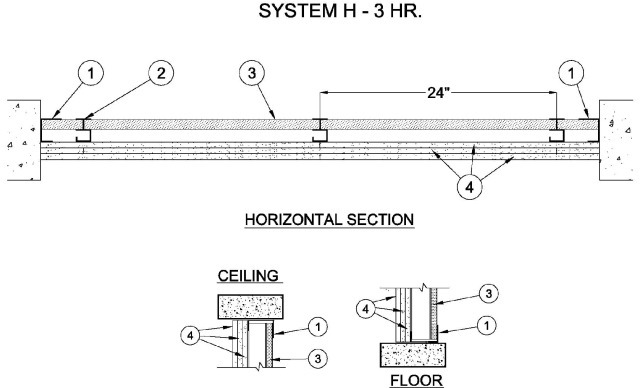 Horizontal joints need not be backed by steel framing. 5. Batts and Blankets* — (Optional) — Mineral wool or glass fiber batts partially or completely filling stud cavity. Any mineral wool or glass fiber batt material bearing the UL Classification Marking as to Fire Resistance. 5B. Fiber, Sprayed* — As an alternate to Batts and Blankets (Item 5) and Item 5A — Spray applied cellulose insulation material. The fiber is applied with water to interior surfaces in accordance with the application instructions supplied with the product. Applied to completely fill the enclosed cavity. Minimum dry density of 4.3 pounds per cubic ft.
6. Joint Tape and Compound — (Not Shown) — Joints covered with joint compound and paper or mesh tape. Screw heads covered with joint compound.